@FactsMatters: Trump colluded and The indictments showed collusion. @SaremChuuk: They colluded to steal the election with the Russians. 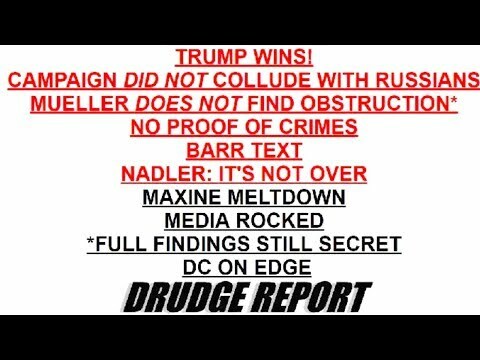 @redsnapper: Collusion and obstruction are coming. @errr: Mueller will indict Trump for collusion and obstruction. @visafree: He is guilty of obstruction and collusion according to the expert. MUELLER REPORT: TRUMP CAMPAIGN DIDN'T COLLUDE WITH RUSSIANS AND THERE IS NOT ENOUGH EVIDENCES TO INDICT ON GROUNDS OF OBSTRUCTION. THis is not the Mullers Report but rather a Bar's owns version of the Real Muller's Report. the Mullers's report is still on hold by Bar. when it's gonna be released to public? is still unknow. which makes the facts clear, Trump is guilty and Bar is holding it unknown to the public. no indictment means more concocted hoax by the same leftist ideologues who have lost credibility and public trust. We are used to the mob mentality of the democrats since their inception of the KKK in 1864. But law must prevail. the only mob mentality we are witnessing today is in control of the oval office along with his swamp politicains. More debunked leftist hoax. The investigation is over. No indictments. Move on. investigation isn't over until the report becomes public. why hiding what's belong to public? the investigation was paid by tax payers money therefore, the public deserve to see the full report, until then there mis no move on. The concept of law and classified information eludes the libtards....Nothing to see here. Move on. Per Rule 6 (e) which prohibits the release of classified informations and methods of acquiring them. GOP Rep. Nunes wanted to repease a memo unredacted showing the Obama FISA warrant that shows Obama administration used Steel Dossier from Hillary Clinton campaign to spy on Trump. Democrats were against it because they claimed it would compromise " intelligence sources and methods" and they stopped Nunes from releasing the unredacted memo. Now Democrats don't want protect those same "intelligence sources and methods" like they did in 2018. Its all a political BS nonsense ploy from Democrats. They know they won't get release to public unredacted so they are asking for something they know can't happen. Great News Rasta great news. Now we will see how far the system was corrupted by the Obama administration. Mueller report will be released as planned to the public and redacted according to US laws. The constitution survive another assault from Democrats. Hard to believe a American president can't speak his own language?.. " when you look at the orange report", instead of " the original report"? .. man oh man! unreal!! No Collusion and its real. Ask Mueller. Democrats failed to get their witch hunt going. Majority of the world see you guys for what you are. Sad. Majority of the world see Trump and Bar play by the Lawless Rules.. Whenever you hear a leftist justify based on the "majority of..." what they mean to say is their democrat mob wants something. Example, the "majority of .....voted for Hillary Clinton." .....lmao. "Majority of the world see Trump and Bar play by the Lawless Rules"
Majority of the world agrees with Trump. No collusion and no obstruction. And Here are the laws and rules that Trump and Barr are following which were passed by the US Congress.64 Fed. Reg. 37,038, 37,040-41 passed by Congress on July 9, 1999 and Fed. R. Crim. P. 6(e)(2)(B). Rule 6(e) and 18 U.S.C. § 401(3). "Hilary got more vote "
Popular votes don't count when half of them came from California. Its all about the electoral college baby. Trump won majority of the Counties in the US over 3,000 vs Hillary's 500. Majority is Trump. that's not the total tally of the votes? that's only a map colored with red and blue?, only the blind and dumb wouldn't tell. Stop thinking like a democrat or criminal. Stick with the law, visafree. and what law are you talking about? it is the truth, Hilary got four or so millions of votes over trump? The electoral college was established by the framers of the constitution for a reason. Unfortunately, socialist libtards do not have the cognitive capacity to understand the comprehensive rationale behind the laws. The best you could do is follow the law, like a good sheep. Don't follow the mainstream media or the democrat's hate mobs. @visafree, 3,000 counties and 30 States are in Red. That's the Majority according to the US constitution. That's why we have a electoral college. Majority of Hillarys vote came from California and New York. While Trump came from all over the country. it would be nice if you would provide the real count of the votes and not just you words? don't you think so, @ Reaper? you are entitle to your opinion but not your facts. we need evident not just your words. @visafree, 3,000 counties for Trump vs 500 for Hillary. 30 States for Trump vs 20 for Hillary. The Majority for Trump vs minority for Hillary. Hillary lost and Trump won get over it. Read the constitution. Let me help you there. no evident, only words, your counting counties and states, not the votes, the fact is, majority of the votes went to Hilary, Period, full stop!! To help the feeble-minded understand who voted in 2016...it was the states, because it is the United STATES of America. Not the "United ILLEGAL ALIENS, WELFARE RECIPIENTS AND LIBTARDS of SANCTUARY CITIES of America." Trump won 2016 with 62,000,000 Americans votes + 3,000 counties + 30 States + 304 electorals= Majority. This is how it looks like. Visa, get over it Hillary+Democrats lost.